Ceilão was the name given to Sri Lanka by the Portuguese when they colonised the country in 1505, which was then called Zeylan by the Dutch and later transliterated into English as Ceylon when Britain colonised the land in 1798. Although the country gained independence in 1948 it was known as Ceylon until it was officially named ‘Sri Lanka’ in 1972. Sapphires from Sri Lanka are still fondly referred to as Ceylon Sapphires and are widely used in sapphire engagement rings and other fine jewellery. Luminosity, radiance and allure of Ceylon sapphires will continue to capture the hearts of many around the world. In 2003, blue sapphire was declared as the national gemstone of Sri Lanka. WHY ARE CEYLON SAPPHIRES SPECIAL? Sri Lanka, the island of exotic gems, has a colourful gem mining and trading history of at least 2500 years, if not more! It was once called Rathnadweepa which means Gem Island in Sinhalese. Persian traders endearingly referred to the island as Serendip; presumably because the discovery of such magnificent treasures leads to happiness, good fortune and luck. Ceylon sapphires were originally famous for their vibrant medium blue hues. Sri Lanka is the only country that has been producing a seemingly never ending supply of high quality gemstones. It also has the highest density of gem deposits in relation to its landmass with 90% of the landmass said to be composed of gem bearing Pre-Cambrian rock. Whilst the country produces many different types of gemstones, sapphire is the most celebrated. Virtually all colours of sapphires are found in Sri Lanka. The rarest and dearest of all is Padmaraga, also known as Padparadscha sapphire, a word derived from Sanskrit meaning lotus colour, signifying the vibrant coral tones reflected by the stone. Light to medium blue sapphires are the most desired blue sapphires from Sri Lanka. They generally attract a higher price amongst all hues of blue sapphires. In the past this colour was commonly referred to as 'cornflower blue'. 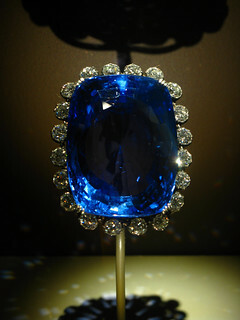 Some of the world’s largest sapphires are from Sri Lanka. 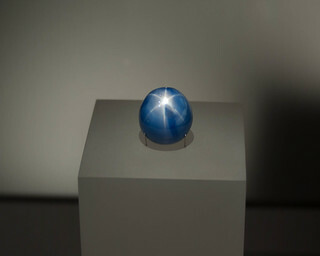 In fact, the world’s three largest faceted blue sapphires are all from Sri Lanka; “Blue Giant of the Orient” (466 carats), “Logan Blue Sapphire” (423 carats - as pictured on the right) and “Blue Belle of Asia” (400 carats). For many centuries, Ceylon blue sapphire have been treasured by royal families around the world. Renowned for their allure and range of blues; sapphires are considered a symbol of love, loyalty, power, royalty and wisdom. 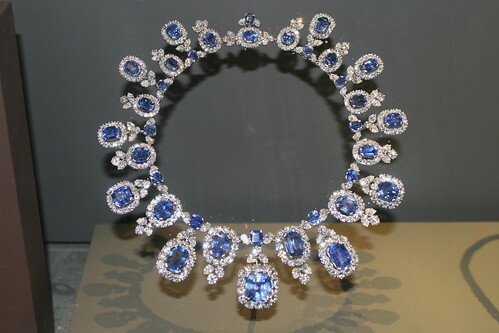 Some of the most prominent relationships royals have had with sapphires are the Ceylon Sapphire encrusted Imperial Crown of Russia worn by Queen Catherine II of Moscow, the Ceylon blue sapphire brooch given by Prince Albert to Queen Victoria on the eve of their wedding (also worn by queen Elizabeth II) and Princess Diana’s renowned engagement ring, currently worn by Catherine, Duchess of Cambridge. 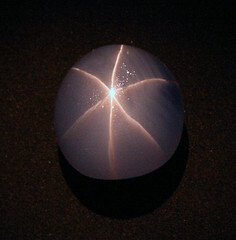 Apart from faceted gemstones, giant star sapphires are also found in Sri Lanka. Many celebrities have also been spotted wearing Ceylonese sapphire jewellery. 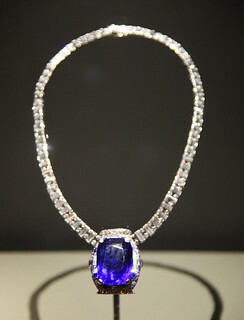 171 carat sapphire necklace, 'Heart of the Ocean' prepared following the blockbuster movie Titanic, worn by Celine Dion to Academy awards in 1998 also came from Sri Lanka.